Unusual old windup toy in the picture. 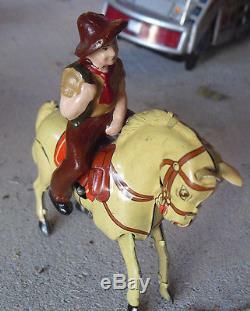 A late 1940s to early 1950s era Kohler tin litho toy, marked DRGM DRR MAde in US Zone Germany on the underside, a heavy weight tin litho windup horse with composite material cowboy. It's one of the nicer horses that I've seen with bright colors, lots of small scrapes, but no big areas of paint loss or dents or damage. The cowboy has a chipped piece from his rear, a crack around his upper leg and a crack all around his neck. The color on him is still really nice. As it stands, it's a really nice looking old toy. About 3 inches tall and 3 3/4 inches long. 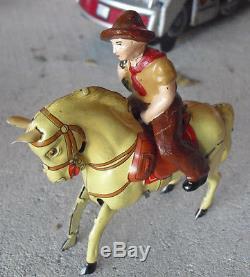 The item "RARE Vintage 1950s Kohler US Zone Germany Windup Horse and Cowboy 3 Tall" is in sale since Friday, November 21, 2014. This item is in the category "Toys & Hobbies\Electronic, Battery & Wind-Up\Wind-Up, Walking Toys\Pre-1970". The seller is "tcagrading" and is located in Thorndale, Pennsylvania.